I’ve spent the past week or so testing a slew of flight tracking applications for the iPhone and iPod touch. One common thread among all the apps I’ve tested—good, bad, and indifferent—is that they require some degree of data entry, whether it’s a flight number, destination, airline, or day of travel (or some combination of all those data points). Appropos Mobile, however, wants to change that. The developer has released an advanced version of its FlightTrack flight status tracker that follows your flights without requiring you to enter your trip itinerary. 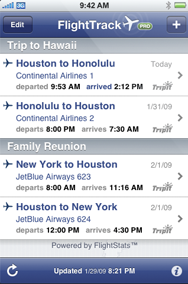 Instead, the newly unveiled FlightTrack Pro is able to import data from the online trip planning service TripIt. The $10 FlightTrack Pro actually made its App Store debut last week, with Appropos only touting its features now. Kazez says the motivation for releasing a pro version of FlightTrack came from travelers who had requested an easier way to manage flight itineraries. Here’s how FlightTrack Pro works. You forward your airline confirmation e-mails to plans@tripit.com, which sends all the relevant data to the FlightTrack Pro app on your iPhone or iPod touch. FlightTrack Pro can then provide real-time flight cancellations, delays, gate changes, route maps, and 10-day weather forecasts. The service does require you to register with TripIt, though registration is free. Appropos continues to offer the $5 FlightTrack on the App Store. Kazez says the original app is aimed at all travelers while the new pro version is ideal for frequent flyers and business travelers. Both apps work on any iPhone or iPod touch running the iPhone 2.1 software update.